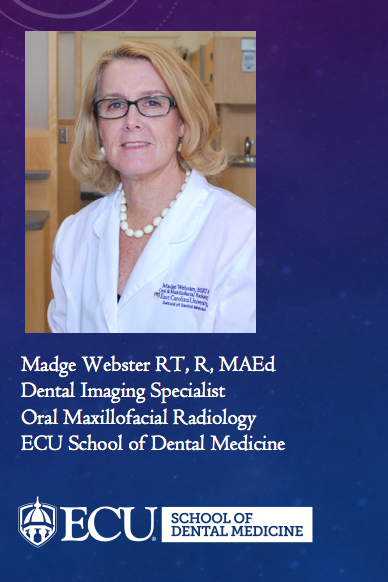 This course is designed for the office trained dental assistant needing dental radiography certification and has been approved by the North Carolina State Dental Board Examiners (NCSDBE) pursuant to G.S. 90-29(c) (12). The Intraoral Radiography Certificate Course consists of two components; Part 1 is an online self-study designed to teach the fundamentals of x-ray production, safety and protection. Part 2 is a hands-on clinical component designed to teach receptor placement and exposure techniques needed for successful dental imaging. Both Part 1 and Part 2 must be successfully completed prior to receiving certification in Dental Radiography. After the successful completion of Part 1, participants can register for Part 2. Participants will have one year from the date of initial registration to complete both components of the course. No refunds will be provided, except in exceptional cases approved by the Program Coordinator, Madge Webster. Part 1 requires completion of eight instructional modules, three videos on intraoral receptor placement and the final exam with a minimum score of 70%. Part 2 entails hands-on work for a total of 30 hours under the supervision of the Program Coordinator, Madge Webster. Need Help? Contact Us At 252.328.9198 or email at cpe@ecu.edu or llp@ecu.edu. Like our Facebook pages for Continuing Professional Education and Lifelong Learning Program.